library book rack on the wall near the door. This was originally an 'indoor greenhouse' pocket hanger. I slit the bottom pocket's stitching and restitched it with the sewing machine a few inches over to accommodate the larger books. It would be ideal if that pocket was just a little deeper...but this was ready to hand and something like it online to order was expensive when I looked! I definitely count it as a win because Esme immediately took one book to the bed and read through it laughing at all the funny parts - put it back - and chose the book to read again today. ---We did the first draft and colored in the range map from looking at the maps in the articles. I want her to add more information later this week, review the 'readability' of it and think about organization of it this week - so she can type it into a book format like her chicken report. We touched on a lot more interesting information than she wrote down today - she was just so unhappy about writing it out. 10a - reading aloud: "The Hippo-NOT-amus"
11.15 - Nova: "America's Stone Age Explorers"
//She spent several hours out in the yard trying to create spearheads out of stones and searching for leaves to make some sort of habitat? It is 7 pm and she is still out there trying to make and/or find stone tools. ---She had to copy (writing) the problems out on another page of paper and write the answers. We spent almost half this time talking about the 'Critical Thinking' part where it compared baseball scores and innings. 10a - library - she played with the instrument program while I picked out half of her books, then she picked out the other half. 11a - park play with kids, P.E. ---We looked through the Natural Wonders of the World book and identified some things. We watched part of the Inside Planet Earth geology video tonight at dinner. It answered some of her questions about volcanoes, earthquakes and more. She's outside playing mountain climber now. So, this week we have done math and numeracy, writing (report, and prompt), lots and lots of reading, Biology (animal studies), History (Helen Keller) and Geography, Geology, Spanish, P.E. and Technology. I have been asking her lots of vocabulary words in the Grimm sisters books - some of them might be sticking. That hits on all of our goals and yet being a full work week it could have been terribly stressful and it wasn't. 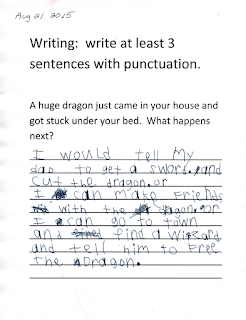 I was telling her this week that second graders write a whole lot more than she had been doing - and we met our goal to do two writing activities and to also work on our writing in math (number names) more. Considering expressive writing is her most challenging subject and she hates to spell - we are coming along much better there. I've heard changes in her speech again this past month - she has made more ground there and has been picking up new words from her reading. Sciences (Biology and Geology) once each per week. 9.15a - writing prompt - If you could live anywhere in the world, where would you live and why? ----"I would live in Japan. I like the soup. I like the way the roofs are shaped on the houses." ----She made a lot of ground after begging me to allow her to play this. I previewed it last night and it looked involved and complicated enough to count as some school time. She read instructions, followed quests, and learned new controls and interfaces. This is an important part of our goals for 'engineering primary school', that she discover new things, really get into the workings of them and make and achieve her own goals. Of course, the game or interface has to have things that really teach, too- not a pony dress-up game, but something with strategy, quests and lessons. Tomorrow is a library day, and my day off- so we can get some more done. This has been my 'six days on, one day off (Sunday) and four more on' week and it can be tough even without incorporating school goals into it. I am very proud of the amount of writing she has done this week. 'Writing and writing to the end of time etc..' as she said it was this morning as she despaired over the two worksheets on her desk. She has really shown she has the ability - we just have to get in the practice. I am hoping to cover another section in our Social Studies book 'People Together' tomorrow morning before we leave for the library. She has things to show me in the dragon game that she is proud of - she begged tonight to spend some time tomorrow showing me the new things she has discovered and what her dragon has accomplished 'in only one day - I was so amazed' in her words. --this is something that I want to make sure she can do from memory, and not needing to copy the words... so we will do it several times this week with the word list and next week she doesn't get a list of the words to look at. At least, that is the goal. ---She compared infinity to a tree, a fire that never stops burning, and a phoenix's life cycle of dying and being born again. About the tree - she said she was the root, and the bark and wood were her parents, and the branches and leaves were her grandparents going back all through time to the tiniest little branches and leaves forever being 'infinity'. Then she backed up and said she was the seed, just beginning to break, that the root would grow from..because she isn't grown up yet. ---Actually she started her research at 5, after I had come home, gotten settled in from work and explained what she needed to do and what questions she needed to answer. She could read words off of the question sheet, type into Google, hand copy words back to her sheet and ask for help with spelling. She was very good at all of this and put up with lots of writing. She was really TRYING to be good today so she could play some Skyrim. We cooked Cheesy Joes (without tomato sauce) for dinner and she watched me cook. We put in the Miracle Worker (the black and white one, which we got from Netflix) She was not enamored of it at first - and it starts out quite intense and continues like that for nearly the entire 2 hours.... but I think she got a lot out of it with massive explanation of what was going on and why. We also practiced a little sign language alphabet. She did play a little Skyrim just before bed, and we read 20 pages more of the Grimm Sisters book. 8.45a - reading "Yoko Paper Cranes"
---Quote: Do I need to do the Critical Thinking part? Do I need Critical Thinking? ///Yes, yes you do. 9.30a - reading "Crawdad Creek"
10.45 - discussion of division and multiplication. with beans. ---Daddy said he showed the properties of division and multiplication, and had her multiply and divide groups, relating one operation to the other. --Racing pigeons are her favorite type of pigeon, she says. 6.15p - Documentary: "Deep Sea"
Mom Notes for Social Studies : I did a 'distilled' George Washington writeup for her to read with me later this week. It is printed and ready to go. I plan to make a few others to start with - Ben Franklin, Abraham Lincoln, Thomas Jefferson. I also saw a 50 states set of worksheets where the states are all printed in the map except for a random 10..and the student has to name those from a list and put them in the right places. Printing out some larger maps of the Northeastern seaboard and the District of Columbia I realize there are things I would not have known had I not looked them up just now... like the Pentagon is in Virginia, and the District of Columbia is between Maryland and Virginia (and just how that happened, although that is a bit advanced for Esme right now). Her quote seeing me studying this is that D.C is a 'popular place for all America and has the White House.' Well..ok...we're at least starting somewhere. I need to do a writeup on mayor, governor, state legislature, congressman( Senator and Representative) and President for her as well. I need to do some more of my own research before I can make sure I'm presenting that all correctly. Other Notes: Our hardcopy math book arrived today. We have been using Khan, an online PDF, worksheets and the Gifted and Talented workbook to assess where she is at in math. Now, we're getting ready to go forward. Her hardest parts will be reading the directions and doing word problems, making graphs and charts etc. She has a very good idea of the operations. We've had a relaxing day at home - still got some work done - cleaned out the chicken house and their yard (nettles were encroaching) and did some housework. Esme and I played Monopoly and looked up various things. We got into Netflix again to get some documentaries for school this year. There are several things on there we are really looking forward to. --They bought supplies for the 'skin layers' project for next week (marshmallows, graham crackers and cherry pie filling), and they also bought a good kite as she has been wanting to fly one again. We made our plan yesterday to get these things done, and we were able to do it! --All of the colors of the world disappear and turn violet, then yellow, then pink..then blue? How do people react? What does the Blue Jay mean that he doesn't change at all? --next time we need to practice all that we have learned. 8.30a - reading aloud: Spinners book, "A Bowl of Sun"
--The story is about a blind girl who moves to a new city with her father and learns a new skill (pottery) that helps her feel capable while she is adjusting to her new world. We discussed the challenges of being blind and talked about the questions at the end of the story. We also compared deafness, as one of our puppies may be deaf in one ear. She discussed the different ways of finding out about the world through other senses. --We painted the clay game and models we made the other day. She mixed more colors for herself and scratched her head at not being able to make the brown she wanted with the colors available. I need to get some pictures. Her snake turned out very well despite that. After I got home from work she showed me all that she had done in Ice World. 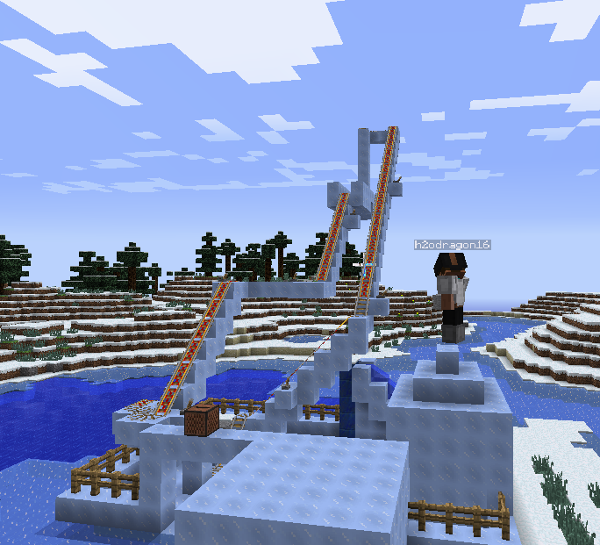 The rollercoaster has a 'drop off' but 'you still live', in her own words. She had also made a carnival game with prizes for shooting arrows at targets. We played for a few minutes. We also talked about our goals for tomorrow's school. I read 20 more pages of the Sisters Grimm book #1 while she got ready for bed tonight. She listened and paid closer attention than she did last night. She asked questions, too -and told me what she thought was going to happen next. Math : 3 sheets each of fractions and also subtraction. It was a lot of math for her..she wasn't very happy about it. But, with coaxing, she did do it. Reading: Her reading aloud: "Unloveable" D. Yaccarino I read 20 pages of the first Sisters Grimm book to her before bed. We played in Minecraft in an ice world seed and she made a hamster burrow with multiple rooms and food storage after she read the article about them. 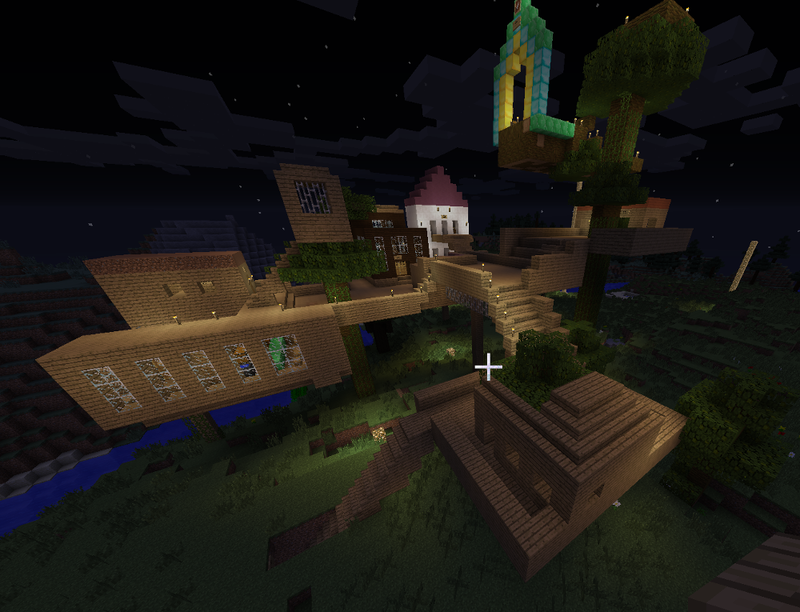 We had an eventful weekend, lots of Minecraft and swimming. The parents of us are a bit sore from the swimming. Esme is a little less freaked out about the idea of swimming, but hasn't really swam yet, just jumped around, splashed and tried to float a little. She was able to go under without swallowing water...she has the keep-water-out-of-your-nose thing going better than I ever did. 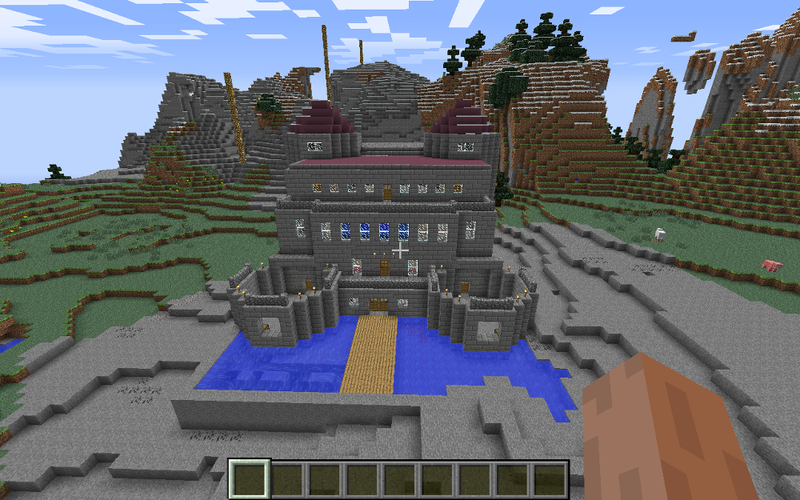 This is the castle I built in Minecraft. She built a few other things and helped some with the castle. We both built food carts in Bird City. 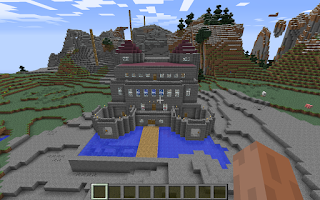 This castle is off to the side in a flat space in the mountains. She read several books today - including Mouse Soup, and Wild About Books. I had her read a chapter of our book to herself when I got home and report to me what she read. That is a skill she needs to develop to read books by herself. Mark and her rode bikes outside. They did some more of our workbooks for math, G&T English and Reading Comprehension. When I was home we watched the Earth documentary Grandma had Netflix'ed and enjoyed it quite a bit. Now she is playing with a little bit of the air dry clay I had planned a lesson for - but we haven't gotten to it yet. She has been begging for it and I gave her a little piece to try tonight. I really have to dig all over and find our clay tools before we get further with it. I looked some tonight and did not find them yet. I'm halfway through the second Sisters Grimm book, and several more of our books came in the mail that I had ordered - the sequel to my 'The Immigrants' and the Stephen Hawking George and the Secret Key to the Universe which is a little bit old for Esme at the moment but maybe a bit later. We've had a busy but nice day. We took Grandma to town, went to the library, park and such...and Esme got to play with lots of kids. I filled up our library cards again with new stuff - including the Sisters Grimm books for me to start reading in prep for her to read them 'sometime'. They are very funny. I got two of them as I was a third of the way through the first before we even left the library. We got some great readers at the thrift store and a dollar puzzle...which I had been craving to do a puzzle for some time lately - something about 500 pieces and interesting, and not expensive. This fit the bill.. and I kind of devoured it at home tonight. Esme is at Grandma's and Mark is thinking of taking her for swimming lesson tomorrow. The dinosaurs had a fashion show, today - Esme made the purple vest and I made the fancy dress. 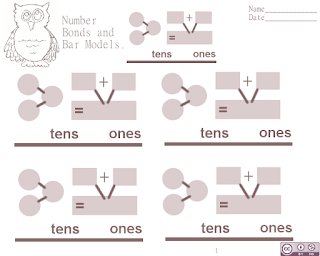 We also did an hour of math, with the tens worksheets and the number bonds. She did the worksheets well, but her comment was that they were making simple math very complicated with all of this breaking down the numbers... I introduced 'America the Beautiful', she read the words and then listened, although she really didn't want to. She did some drawing, read the rest of her library books (which I had gotten all new ones on Tuesday!) and played more Snail Bob. Daddy and her went grocery shopping and took care of puppies, then came and picked me up from work. We made more for the dinosaurs and she is now planning a wedding for them. The boy is 'Drago', and the girl is 'Celia'. We are hoping to have a fun weekend. I have the days off from work and if the weather is nice we will go to the park and maybe play at the lake. We will refresh our library books tomorrow when we take Grandma to town. Another day list... maybe I'll do one a week. making tens worksheet from Math Spheres. -----somehow we turned into P.E. before I noticed, and then back to math, and then back to P.E. reading 50 states names happened several times in there, too. 9:00a - dragon craft - construction paper and tube .. I should get a picture of it, it is cool. When I got home she was doing a program called Snail Bob which is a lot like the IQ ball game she used to play in Kindergarten. It is problem solving and doing things in the right order to achieve a goal. She was on level 22 by the time it was getting where she had to think very hard to get it right.. and it was late. I've planned a patriotic song for her Social Studies tomorrow and am about to go collect up a few more worksheets for her math. The next steps are decomposition of numbers by groupings (making friendly numbers) and also by place value. I'll focus on a bit more graphing exercises next week. This should print out on 8.5 by 11 inch paper. The small set up top is to write your own example for the learner so they can see what is expected. 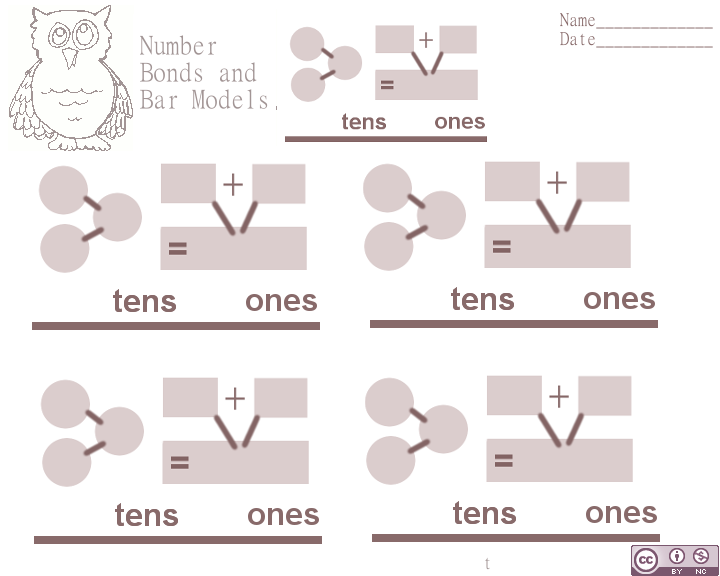 I did the bar models with + and = in them so they make sense.. and then on the next sheet I will remove the symbols. Today was full of things, antonyms, synonyms, reading work, fractions, a walk to the lake to look for life in the water, grass etc etc.., and P.E and weight lifting with Daddy. It was just so nice the lake was beckoning. We went in the water up to our knees, poked in the shallows, looked at flowers, bugs and grasses. Then we needed a good bath to wash all the mud off! We caught zero tadpoles, but we saw three fish. Esme made her paper Tennessee flag as part of her Social Studies project, and Mark dug out our real Tennessee flag to let her hang them both up in the house. She was very proud of her work :) Our social studies unit today showed the differences between states, countries and continents - and introduced state capitals, flags, trees, flowers and birds. She learned the state symbols for Tennessee and made this flag with glue and paper. We also printed out the names of all 50 states and went through how to pronounce them. She said they looked like a little family. Everybody had to pose with squash. We did the flea market and the other library today. Esme had really wanted to go to the other library - and I think I'll try to make a time we can spend longer at it another week coming up. She found some amazing rubber butterfly models and a kiwi plush which made her day at the flea market. We looked up and read about kiwi birds as part of our reading for the day. She learned a lot of cool things and transferred that to making a kiwi burrow and costume in the Minecraft. She wrote several signs to label things and read three books I had written and placed into the library. I have started working with her on some of the Spectrum Test Prep book - to see where she is at with her reading comprehension and English skills. She did four pages with some questioning of what they meant -especially on the phonics questions...she wondered why someone would want to compare the vowel sounds one minute and the end sound the next etc etc... but she did well. I found a book at the other library on their tiny sale shelf called 'Secondhand Magic'. I think I will try to get her to start reading it with me. She loves kites and magic, and it is about both. I found a novel for me and two English grammar type teacher's manuals that could give some ideas - for a quarter for each book there isn't anything to lose. I've ordered a Stephen Hawking book 'George and the Secret Key to the Universe' which will arrive in maybe a week. She said it was a cool worksheet because she just had to look at it up and down and she didn't know what they wanted for a second and then she did and it was easy. It was the one where all the equations added to 20. The number sequencing patterns were not taken as well...but she is good at this if she tries and needs practice after a summer off. She likes to try more when there are cute pictures - but the sheet I gave her today was just text, so she had about three despairs during nine questions. Mama Notes: I reached 45% fluency on Duolingo. I'm still doing lots of practice sessions...which are really helping. So I maybe do one or two new modules a day and then practice for the rest of the 50 points. 50 points per day is officially their 'insane' level....A few days a week I don't make it...but that is how it goes. I also bought some soap at the flea market from Dry Hollow Farm, and baked some apple cake. I'm listening to more music on Spotify, a few new things here and there, and lots of the ones I've found that I like as they pop in my head. It keeps the 'elevator music' out of my head from work...although I've picked a few of those out and added them in..KT Tunstall, Alanis and a few others here and there. Painting theatre scenes for her play 'Tiger and Pig Go to Space'. Look, I have a brush! Why do you need to keep taking pictures? To show what it looks like now you're done. So we started on our play for the stick puppets today, after doing some initial reading and math work. We wrote a script, her dictating and me showing how it should be laid out and making comments. Then, we had made 8.5x11" plans for the scenes drawn out with crayon. We painted two of the scenes on the big box I brought home from work. We also played Minecraft and built 'bird city', a place with birds nests, shops and a birdbath. I added a purple martin house, and we looked up info about flamingoes, moas and dodos as well as toucans. Mark said I should post about these math lessons we've been working on. We reviewed rounding last week, to tens and hundreds. I took pieces of paper and marked them randomly 0 through 1000 - about 20 pieces of paper. I put a 'timeline' like long header of paper and marked it 100,200,300 through 1000. Then I had her sort which ones, rounded up or down by the rule, would go where. She did this once as a short exercise with me, and again for review (with more papers). We will do rounding to decimals in a bit.. she was already doing that in the store, and I will maybe wait for our 'store' project to have a session on it. The Pirate measuring thing was I had her make a 'treasure chest' of a known number of inches wide and tall. She had to use her ruler for it -which she wasn't entirely happy about. Then, she had to guess/figure how big a pirate ship hold would be to contain three layers of chests, four chests wide (12). She had to measure a piece of paper this big, cut it out, and compare the chest to the space. Then we cut a 'boat' for the hold to go in, a 'mast' a certain # of inches tall, a triangular sail a certain number of inches wide and tall, and a man who was not too tall to fit within the ship hold. She got better and better at tracing straight lines and measuring height or width as asked...although it started out very hard. Ordinal numbers - we have cut out squares with racehorses printed on them, and put two or three digit numbers on them. She has to sort them greatest to least by their value. We will talk about greater and less than again, like we did last year. Relative weights of real things and comparison - I found the relative weight of about twelve things, the heaviest being a truck and the lightest an apple. She will compare which is lighter or heavier, how many of the light things would make up the heavy item, which items would add together to be a little less than or more than another etc. This is leading into my working with her with simple symbolic equations, multiplication and division after we review all of this and adequately borrow and carry again (she has become rusty). There are 'geometry house', 'make your own store', and 'advertising' lessons I printed out to adapt for her, too. Also - I scored another big cardboard box, which we will use to make our next cardboard theatre for puppet shows. We will work on that and 'writing a play' this week. When the taps are on...... Esme has been philosophizing and asking lots of her signature type of questions. Some of these came up in the car while driving, others while she was washing her hair in the bathtub (which I sit in the side room with a book in case she needs help sometimes). Why does hot make our skin have water? (Why do we sweat?) // discussion ensued about sweating and temperature regulation, said we would find a video about this. Discussion about skin layers, blood, sealing of wounds with the parts that are in blood // She sprung this one on me while I was driving and I got some of it explained to her..told her we would do more when we did our biology this year. Like when I choose a game, and I can't go back in time and choose another game and play it instead because I already chose one. Why can't we go back in time and try the other thing? // Discussed making good choices along the way because no one gets to 'play the game twice'. There's something very special about me but I'm not sure I know what it is yet - it's like a superpower, or like a video that plays in front of my special kind of eyes of my memories when I think about things. I'm still trying to figure out what it is. How was the Earth formed? How did the Universe get here? The whole thing? How did the people and animals get here after the Earth got here? //discussed both Big Bang and religious ideas...told her we would find a video about this. I like science, it made everything happen and that is how we know things. // No, Science is a way of us trying to figure out what could have happened and why, we guess and then we try to find out why the guesses are correct or wrong. Asked to find out more about the Ice Age and how that happened. 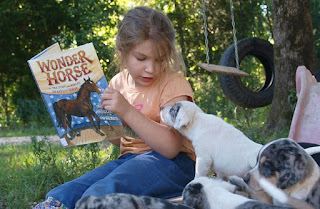 Esme read several books to the puppies for her reading today - I've had a discussion with her on getting the ems and uhs out of her reading...she reads very well but she puts a lot of these in to the sentences as I can see her eyes darting ahead to read the entire sentence before she says it. She hates that I mentioned it - but maybe we can help her break the habit this year as I know it will bring her down in any tests they will want to give her next year. Speed-reading tests was one of the most anxiety-causing things for her when she was in public school. She did P.E with Daddy (including weight lifting) and reviewed her math and vocabulary concepts from the week. She then finished her rock kit from the first day of school. After I got home from work today we did a few lessons online in Spanish. Now she is playing in her room with the radio on. She gets the weekend off while Mama has to work early each day. Late breaking news: We made these puppets for next week. We are going to make a puppet theatre box (she likes those a lot) and put on a play to be recorded on the tablet. I said I wouldn't post time lists as much this year, but today is one to record. I had this feeling through the day 'will we ever get it all done', and even after we finished...it felt like the day was a bit hodpodge and incomplete. It was rainy though, and I think the weather was affecting me. Esme said she learned a lot and retained quite a bit when I asked her questions later. She woke up super early, found a worksheet I had printed out -and was off and roaring. I was scrambling to find other things for her to do to continue the math streak. The pirate ship measuring task was trying...but she did persevere and came out with a good project. We'll come back to a task like that in another week or so and see how much she has absorbed. ------I printed and de-articulated a paper skeleton, placed it on her wooden tray and covered it in beans. She used a paintbrush to find the pieces, then reassembled them by gluing them onto a sheet of paper. We did some P.E. as Frisbee and she helped me cook grilled cheese sandwiches. We watched the movie Space Camp, and she paid closer attention than she does to many movies. 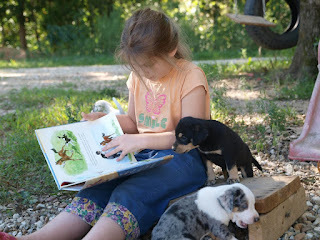 Mark wanted to take pictures of Minerva's litter of Catahoula puppies. There are nine, but apparently two of them look so close to each other we weren't sure which was missed! Columbus and Esme looking over the entire litter. She drew the measuring, marking and cutting card for tomorrow again (again, her luck! )...which we hadn't actually gotten to do. Also addition and subtraction with carrying and borrowing. I'll be testing her again on the matching game for the words at the end of the week. Part of our play today was building a 'cardboard cave' and painting cave animals on it (marker, really)...I printed one out and she cut it out and traced it. We discussed Lascaux cave in France, how it was discovered, how old they think the drawings are and what they think they represent. We also did some rounding number math - of which she said it was too easy, she knew that stuff, why are we doing it, but kept going and going on the Softschools app I brought up. She drew that math card again for tomorrow...and we will do a bit further into the subject. I had her do a worksheet that was a little harder and she was able to do it by herself with no trouble. We read our first section in our Social Studies book 'People Together' and discussed it. She is not enamored with it...but she doesn't 'know' everything in it, either...she was getting things very mixed up so we might have to go slower than I planned on this or it just might have been focus issues (She was like herding cats during the end of the cave project and during the social studies as well). If I hadn't had to leave for work at noon I would have had her take a half hour break instead of starting the reading. We did poetry - we read several poems and she wrote a poem "from the viewpoint of a cat" as was a suggestion in a prompt site. 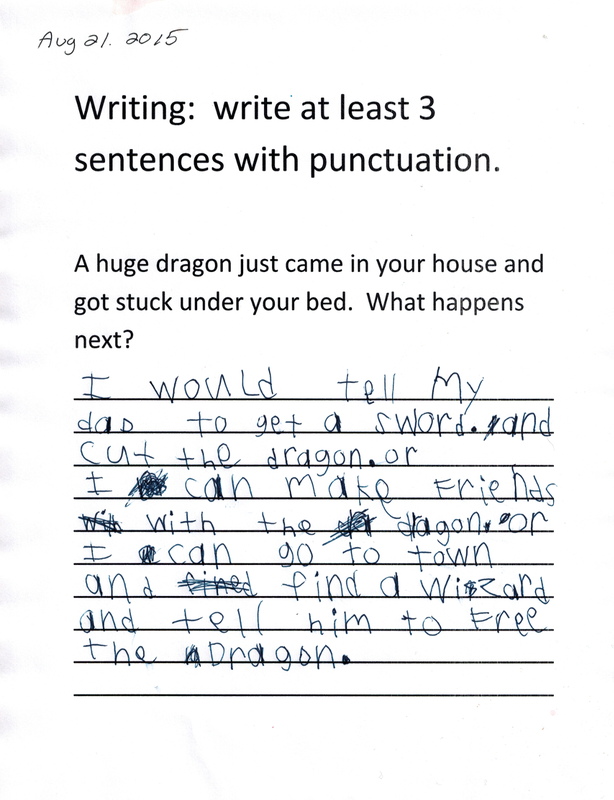 She dictated the words again/ I read this a good way to get them going for the first part of elementary years, and then stress more handwriting own production as the year gets further on...stress having _Good_ production before the technicality of writing it all out. We discussed using adjectives to describe things better - we will be working harder on noun/adjective/verb again because she needs that refresher course. I no longer have a frown. NOTES: At the last minute, the night before we started school I came up with an idea to 1.) give Esme some feeling of 'choice' in what she does for the day and 2.) Make sure we cover things without getting in a rut or just arguing about what to do wasting time. I made up two decks of cardstock cards - one purple for Reading, and the other green for Math. I have had her draw two cards from each deck and that is our suggestion for what to do for that subject for the day. Some are specific, and others are open-ended. She and Daddy can suggest things to go in the decks. Example : Tomorrow she has chosen 'Read a book from your desk or shelf' and ' Read a news article online' for reading. For math, she has drawn (for the second day in a row, what luck) 'Place Value and Rounding numbers' and 'Measuring, Marking and Cutting project' (geometry). She agreed we can take the rounding to the 'next level' just a teensy bit and she would like to do it some more. Having her pick them the night before gives me a chance to arrange some thoughts for the math, especially...and be ready to work with her towards a goal the next day. Retention: I'm thinking about giving her a 'test' at the end of the week, or near it -- about major info we learned during the week..and see if she can remember it. She doesn't like this idea. I think it's important. She had great retention about Lascaux but couldn't tell me any of the reasons why we might round numbers (she had been drifting and trying to go play when we were discussing that). "It was a bit of work, but then I finally got a prize. It's like trying to win a contest, but you finally get a prize for your work. You do hard work at your job and get money for the house -and I got these gems." She found three of the eleven gems, identified them on the map and wrote a report with me (she said the words and I typed). We did a lot of other things, too -- math, reading, art and writing in her reading comprehension workbook. She helped Daddy assemble and mail the bills. She spent an hour on a 'RV hovercraft ice cream truck' with doors, windows, roof and ice cream symbols inside it for the 'workers counter'. She has a great idea for tomorrow - looking up info about cave drawings. 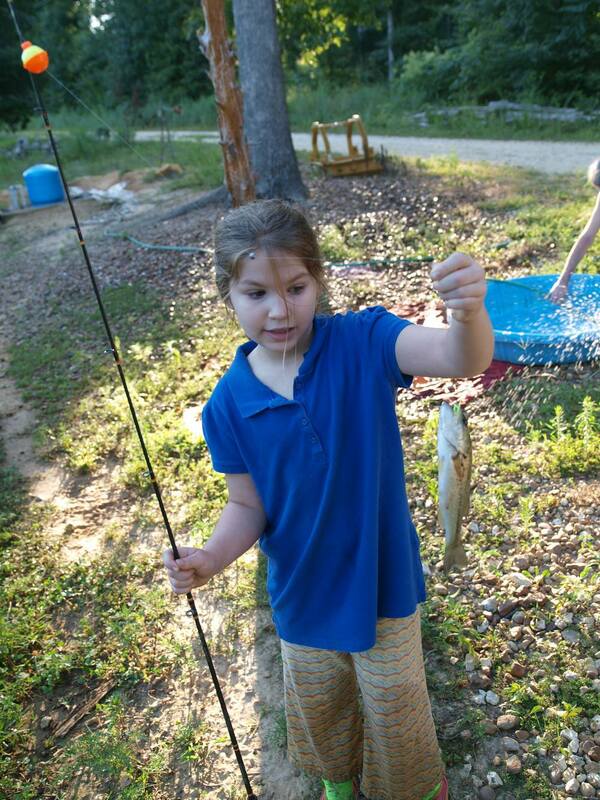 Esme had really wanted to go fishing yesterday, but it was just too hot. 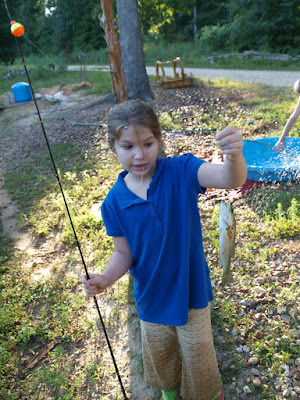 So, we had an early morning fishing trip to the lake - and one small mouthed bass. It was pretty torn up by the hook, so I had her walk it up to the house for pictures. As you can see, she was kind of uncertain about the whole thing! We threw it to the chickens, but hours later Mark said they were still hiding in the corner of the pen and pointing at it like a threat to their well-being, so he tossed it behind the garden. More play and additions to the 'Ecosystem' project. She had made a log to dig earthworms and termites out from underneath, but then she decided to add a squirrel, and a new tree for the squirrel, and (not shown) there is a little pocket in the tree for the squirrel to hide nuts inside. She took the story book we wrote last night to bed with her again and tucked it behind her pillow. Note: Also, she had gotten stung by a wasp on her foot (she told Daddy it was a horsefly bite) - watching it closely... she told me her sock felt a bit tight and she hadn't really realized it was anything different. But, it is puffy. Should go down tonight or by tomorrow morning... we'll see. My family has a reputation for being very allergic to such things so for her I would call it a reaction, but not a serious one.